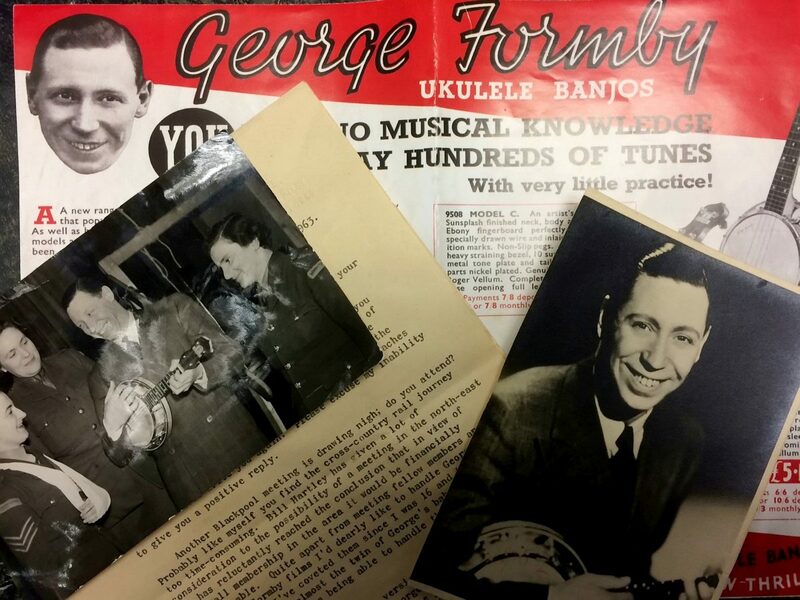 A pair of iconic ukuleles used by comedy legend George Formby have fetched almost £24,000 at auction after decades of gathering dust. One of the instruments was used in the film ‘No Limit’ which helped launched the career of the legendary entertainer in 1935. Formby became Britain’s biggest star in the 30s and 40s and was famed for cheeky songs such as ‘When I’m Cleaning Windows. He entertained allied servicemen and women during World War Two before going onto to forge a burgeoning film career and became the UK’s highest-paid entertainer. Today (Tue) his Keech ukulele sold for £11,414 along with a Dallas model D “banjolele” ,used on stage by the star, which fetched £12,493. The two instruments had belonged to the entertainer’s “biggest fan” George Johnson who amassed a staggering amount of Formby memorabilia before his death last year. Mr Johnson had kept the collection, he secretly added to over 60 years, hidden from his wife so he wouldn’t get into trouble. His family made the decision to auction off the instruments after they had spent years gathering dust in cupboards and on the top of wardrobes. 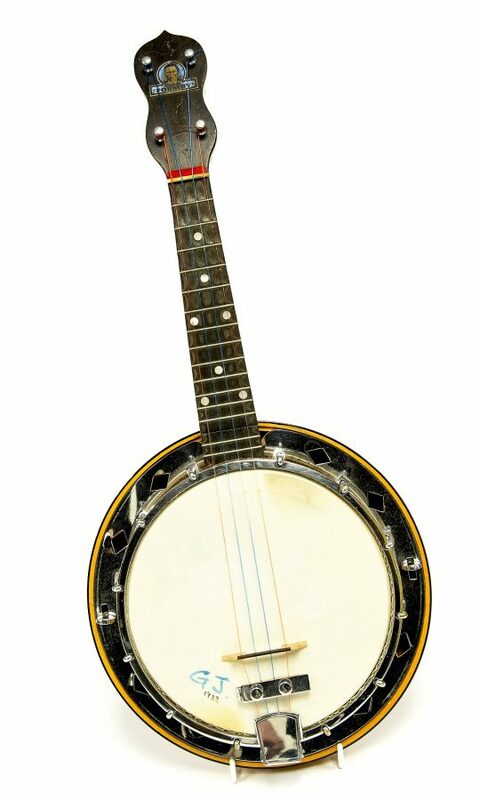 The Dallas D ‘banjolele’ was purchased by Formby fan Anthony Mason, 61, who regularly visits the entertainer’s grave. The painter and decorator and bar owner, from Salford, Manchester, who : “I would have paid more. 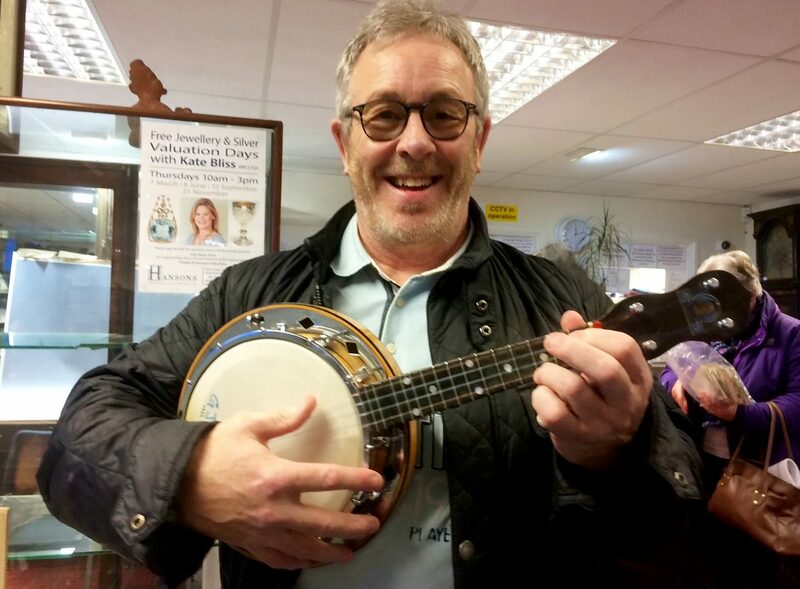 “I’ve liked George Formby for years, since I was a boy. I even visit his grave in Warrington cemetery. “I knew the ukulele was up for sale after seeing it on telly and just wanted it. 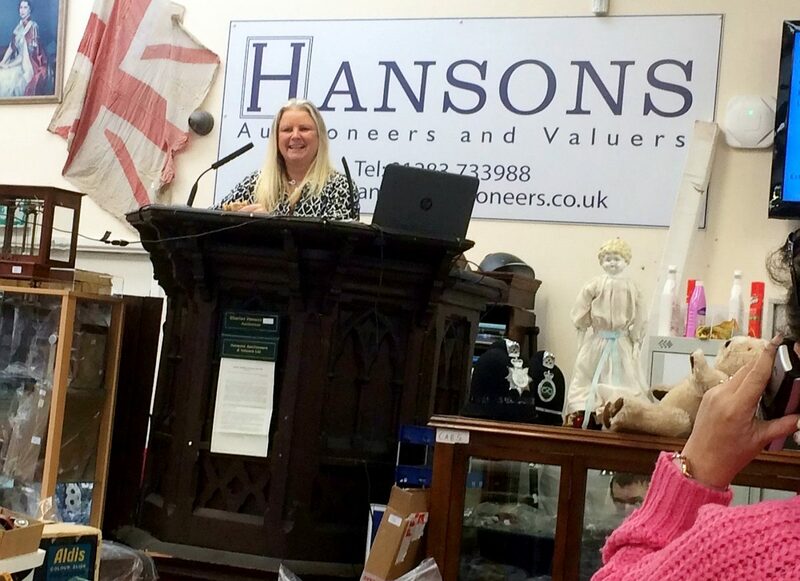 Claire Howell, music valuer and auctioneer at Hansons, said: “I’m delighted for both buyers. “These are incredible instruments to own with a rich provenance and pedigree. “Mr Johnson was meticulous in keeping all of his paperwork and receipts. He bought the banjo-ukulele direct from the star’s wife, Beryl Formby, in 1952 for £14. “The prototype model was made by Birmingham’s George Houghton and Son in 1936 and was given to the star to test. “The Keech was used in film No Limit which is particularly popular with Formby fans. “It’s about the TT motorcycle race and it’s still shown in the Isle of Man during TT race week. It set him on his way to becoming the UK’s best paid entertainer. 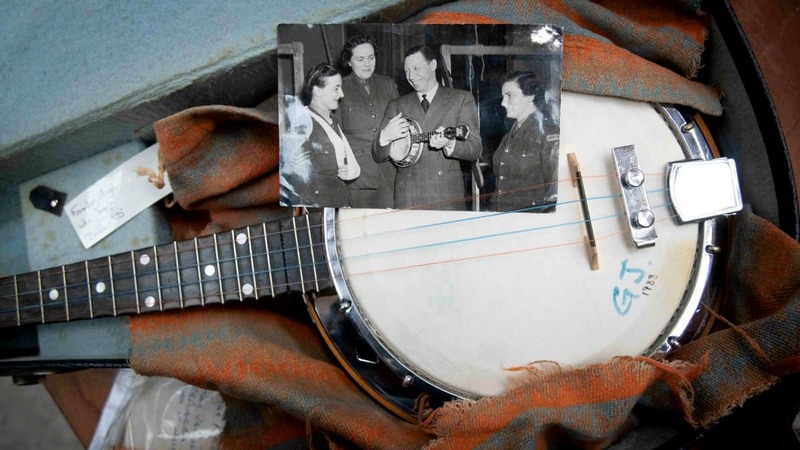 “The Keech was sold in the 1961 Beryldene auction of George Formby’s instruments to a Mrs Welsh for £3 (equivalent to £65) prior to its purchase by Mr Johnson in 1961 for £8 (equivalent to £174). 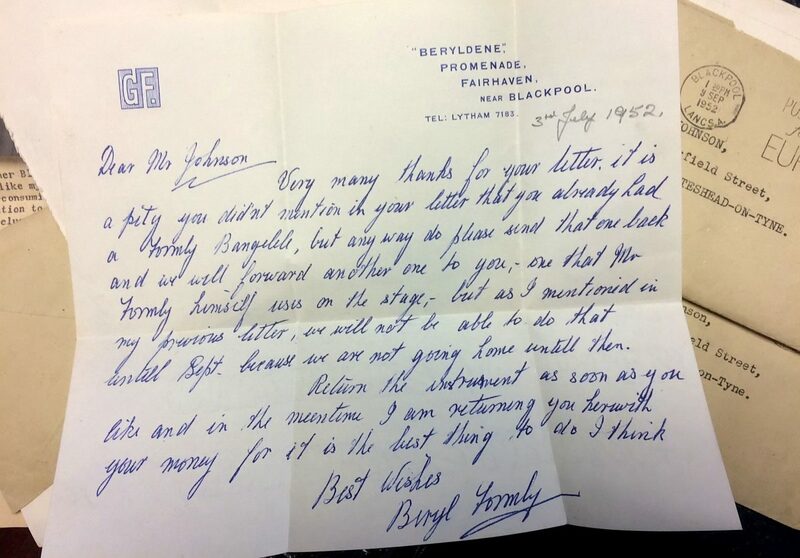 “He was such a huge Formby fan he owned seven ukuleles altogether and accumulated a large archive of Formby memorabilia including records, photos, sheet music, copies of The Vellum Magazine, bow ties and an original script for 1942 Formby film Much Too Shy, which all went under the hammer. Three Formby bow ties, sold for £300 from an estimate of £40-£60 while another lot which included the Much Too Shy script, sold for £450. The memorabilia went under the hammer at Hansons Auctioneers, in Etwall, Derbys, as part of their Film and Music Memorabilia Auction. His son Mike Johnson, a retired electronic engineer from Stone, Staffs., grew up listening to George Formby music. He said: “The tunes are all in my head – I heard them so much at home. “As well as listening to his George Formby music collection, dad would often get out his uke and play along to the music. “After work, he’d disappear for a while and you could hear him whistling and strumming away, having ‘a quick burst on the banjo’, as he put it. “It must have been how he wound down. “He was the 29th member of the George Formby Appreciation Society – and signed me up when I was only four. He saw Formby perform live once but never met him. “He didn’t tell my mum, Mary, about everything he bought in case it got him into trouble. “He kept most of it under the bed and in the attic. Mum, who passed away in 2011, never realised how big the collection was. “The collection’s been gathering dust under beds and on top of wardrobes.